Thanks to dozens of donors from around the world, we recently raised $7,000 to build a 40,000-liter water tank in Takure. This project will triple the capacity of the current water storage and replace the broken, 20-year-old tanks that now service the community. Community members and volunteers have been working every day—moving sand, stone, concrete and gravel—to make this project a reality. Once completed, the new tank will provide more than 50 families with greater access to clean water, helping to keep the community healthy and happy. Last winter during a community meeting, members unanimously agreed on their #1 priority: access to clean water. Shortly after the project began, we established a water council consisting of men, women and members of different castes from the community. The council has worked together to order materials, hire laborers, and help out on days that require more hands. Last week during Dashain festival, 25 community members joined our team of volunteers to pour the concrete ring beam. It was the biggest turnout yet, and we shared laughter, smiles and plenty of sweat! Narayan Bhattarai and the community members that have made this project possible. Things are busy here on the ground in Takure! Rebuilding is in full swing as families throughout the Nawalpur VDC diligently work to have their homes completed before monsoon season starts. Last operational season, Conscious Impact assisted in the construction of 5 homes. Due to the community's greater interest in sustainable, locally-produced building materials, this year we have assisted the completion of 17 homes and have trained more than 10 local mason teams. We currently have a list of 10 families waiting on bricks to finish curing, including bricks for the second story of the Everest Children's Home (an orphanage we assisted on the construction of last year). Paddy and Ari playing with kids at the Everest Children's Home. In an effort to promote greater gender equity, we now employ 4 women full-time and 2 part time at the Training and CSEB Production Center. We are producing ~600 bricks daily, which is quite miraculous when we reflect on the 60 bricks per day we were making in December of 2015 when we were first learning CSEB production. Progress, progress, progress! Rabinia, a new Training Center employee, sieving soil. Kelsey and Ben riding in the back of a truck filled with bricks for a new home. Every week, volunteers are helping move bricks to new homes. In total, we have moved 43,000 bricks this season! We are excited for more volunteers to join us for the last few builds before monsoon, where we will continue not only to move bricks, but plant trees and inspire local youth! Photography by Abi Plowman, Elijah Lazarus, Ankit Tanu, and Jonathan H. Lee. "If families do not rebuild before June 2018, they will not receive government aid." Now is the time. More than two and a half years ago, the powerful Gorkha Earthquake struck Nepal, destroying tens of thousands of homes, and knocking down every one of the 240 homes in Takure, Sindhupalchok. For the last two years, most families have continued to live in temporary structures, built of wood scraps and tin, saving money and resources for a new home. Earlier this year, the government announced that any family wishing to receive the government-allocated USD $3000 in aid must rebuild their home before June. That gives the entire region 7 months to build. Conscious Impact wants to be in the center of this rebuild, providing thousands of bricks to families all across the region. Photo 1: Krishna Kafle, our closest neighbor in Takure, nears the finish of his home’s foundation. Now he must decide which bricks to use to complete his walls and strive to finish his home before June. With support, he will rebuild his home with our CSEBs. To rebuild their homes, community members must quickly dig their foundations, lay stone and mud up to the plinth level (just above ground level) and then find appropriate and affordable building materials for their walls. They can use stone for the walls, similar to the homes they had before the earthquake, but most families will seek bricks to ensure an earthquake-safe home. This is where Conscious Impact can offer support. "Bhaktapur bricks have not only been shown to cause more than 60% of the air pollution in Kathmandu, but have poor human rights records, keeping child employees out of school." Photo 2: A “Bhaktapur brick” production facility near Kathmandu. Recent studies show that this industry creates as much as 60% of the region’s pollution and also relies on child labor, keeping youth out of school. Our hope is that our CSEBs will provide an environmentally sustainable alternative. The most common brick in the market is the wood-fired “Bhaktapur brick,” manufactured by large corporations in Kathmandu and southern Nepal. 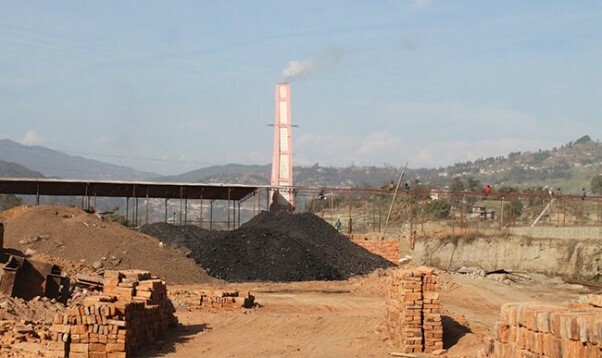 These bricks have not only been shown to cause more than 60% of the air pollution in Kathmandu, but have poor human rights records, keeping child employees out of school. Additionally, these bricks must be transported many miles over the mountains to reach Takure and the nearby communities, putting more trucks on the roads and draining money from the villages to the cities. On the other hand, Conscious Impact provides locally produced, environmentally sustainable and earthquake-safe bricks that are cheaper and stronger than the standard Bhaktapur bricks. "...we believe that the environmentally sustainable CSEBs could become one of the region’s top choices for reconstruction." While it seems that these facts would make the decision easy for community members, the truth is the choice is still hard. The Conscious Impact Compressed Stabilized Earth Blocks (CSEBs) are a new technology in the region, and some people are skeptical. Still, with effective advertising and strengthened community relationships we believe that the environmentally sustainable CSEBs could become one of the region’s top choices for reconstruction. If this becomes a reality, it means more jobs for locals and a sustainable social enterprise that could last for decades. For Conscious Impact, now is the time to invest in this social business. Photo 4: Uddhav Kafle, after two years of working with Conscious Impact, stands on top of his nearly completed home, built with the CSEBs that he helped produce. With the money from his salary, he was able to complete a beautiful, earthquake-safe and environmentally sustainable home for his family that will last for generations to come. While Conscious Impact has a number of ongoing projects (a beautiful earthbag home, coffee farming and sustainable agriculture, for example), growing our brick business is our most urgent focus. This is our chance to support dozens of families to rebuild their homes across the region, and to establish a social business that could employ generations of local men and women. To do this, we need help. Our goal is to supply bricks to at least 20 homes this year, and more if possible. To scale the brick distribution, we need to subsidize the bricks by 12 cents/brick. This will make the price competitive and support families to build their homes more affordably. It is also a direct investment into families’ reconstruction processes. At 12 cents per brick, we need $450 per home (a four-bedroom home with hallway). In other words, for every $450 that we raise we can collaborate with a local family to build an earthquake-safe and environmentally sustainable home. For 20 homes, we need $9000. One hundred percent of any donation goes directly towards subsidizing bricks. Let’s help Takure and the surrounding communities rebuild earthquake-safe homes with earth harvested from their own land and bricks made by their own hands! Support Conscious Impact with an investment into our brick business that will last for generations to come. Create a fundraising page or donate now. For every $450 raised, one family will be able to rebuild using CSEBs. Photo 5: The first brick purchase of Season 3! Prem Bahadur Tamang and his wife stand proudly next to their CSEBs. In the 2015 earthquake, their two-story stone structure fell. Now, they will use these bricks to build their new home, beautiful and earthquake safe. Our hope is that Conscious Impact can support at least 20 other families to have the same opportunity. Photo 6: Buddha Tamang, a local farmer and friend to Conscious Impact, stands in the middle of his home construction, checking the foundation to ensure quality work. Most families are directly involved in the construction of their own homes, and also hire outside masons to support with skilled labor. Photo 8: Everyone gets involved in the construction process! A young boy plays with an empty wheelbarrow on site of a local community home reconstruction. Rebuilding a Sustainable and Earthquake-Safe Home for the Acharya Family. A special moment of connection between Ankit, a Conscious Impact volunteer from India, and Ama Acharya. There are more ways to communicate than words, and with this family we must find alternatives every day. Every year, there is one project at Conscious Impact that steals the heart of every volunteer that comes to our camp. This year that project is the Bimire Earthbag House, a full-power effort to build a new home for the Acharya family, the most vulnerable family in the community. On April 25th, 2015, the Acharya’s lost their house in the powerful earthquake, like the rest of the region’s families, leaving Chandra Bahadur Acharya, his wife, his sister and their 4 children homeless. While hundreds of families begin to rebuild their homes this year, however, the Acharya’s had little hope of ever rebuilding on their own: Chandra Bahadur, his wife and sister are all deaf and mute, unable to communicate with the greater community and extremely economically disadvantaged. For this reason, the Bimire community asked Conscious Impact for support. "The Acharya’s had little hope of ever rebuilding on their own: Chandra Bahadur, his wife, and sister are all deaf and mute." Our amazing “groundbreaking” team of volunteers and Nepali staff working hard to dig the foundation of our newest project, the Bimire Earthbag House. Last month, our volunteers and Nepali staff began the reconstruction process, moving hundreds of kilograms of soil to clear and level the land in preparation for the foundation. Now, we have completed the foundation and next week we will begin the earthbag walls! The goal is to complete the home by January, allowing the family to move into their new home before the cold of winter reaches its height. "These bags ensure that even during the powerful monsoon rains, the foundation of the home will remain well drained and the walls undamaged." The “bag sewing” team back at camp, working diligently to keep up with the rising earthbag walls on site. Today, I was blessed to spend time on site as 9 volunteers plus the family’s oldest son Namraj worked together to lay the first course of gravel bags. These bags ensure that even during the powerful monsoon rains, the foundation of the home will remain well drained and the walls undamaged. It is hard work, but with a big team the bags fill quickly. Each bag was carefully measured, labeled and sewn closed by a team of volunteers working as quickly as possible back at camp to keep up with the work at the site. “Bag sewing” is a daily work task at camp, and a great way to rest the body while still contributing essential work to the project. The family’s son Namraj stands on the edge of the construction site at the end of a morning’s work admiring the progress. Filled gravel bags cover the site and the Langtang mountain range hides behind the clouds in the distance. Sitting in the Acharya’s current house, a small, temporary structure built with broken wood and leftover pieces of tin provides perspective to the project. Seven people sleep on this tiny floor on rice mats every night, and everything they own hangs above them. Yet still, below the drying corn and torn clothes, the mother makes a fire to cook zucchini and cornmeal for lunch with a smile on her face. We communicate with gestures, she invites us to stay for food but we clarify that we will leave before lunch to return to camp. She smiles again and we share a confirmation that everything is OK.
Alex and Mac, two volunteers, fill a bag with gravel as part of the foundation construction. The home sits on a bluff with a beautiful view of the Langtang mountain range. This project will be a large focus of our volunteer efforts over the next 3-4 months as we build the new home from foundation to roof. Every volunteer that visits us will have the opportunity to learn the process of earthbag construction and get their hands dirty moving soil, filling bags and laying the walls. This project will also take a large sum of the Conscious Impact funding, budgeted at USD $8000. If you or anyone you know wants to contribute directly to this project, please write us at consciousimpact.nepal@gmail.com or send us a message. Thank you to the more than 50 volunteers that have already put their sweat and labor into this project, and to all of the Conscious Impact community around the world for making this work possible. We send blessings to you all from Takure, Nepal! The Acharya’s sister sits to watch the construction of her new home. Both deaf and mute, like her brother and his wife, she mostly watches in silence. They say she is also blind, but the way she watches our work I know she must see something. On the 1st of April 2017, the government of Nepal approved CSEBs (Compressed Stabilized Earth Blocks) and many other sustainable building solutions for earthquake reconstruction in Nepal. Families are now able to begin rebuilding with our bricks! Since the approval, we have begun construction on 5 homes in Takure and the surrounding community, while many more are in the design phase. Since the beginning of 2017 we have moved over 30,000 bricks from the training center to homes and projects around our community. The brick walls at the community center are complete and awaiting plaster. The roofing is to be installed this week and will be the final step in completing the structure. The Women’s cooperative building is complete. The final coats of plaster have been applied, the inside building is painted, and the roof is installed. In the next few weeks, final details will be installed, including lighting and electricity. The walls at the children’s home are nearly complete. After the columns are finished the slab will be poured and the roof will be installed. The second coating of plaster has been applied to Sunita Tamang’s earthbag home and the roof is being installed this week. Next week we will begin applying the final two coats of plaster, pour the slab, and Sunita will move into her home! This week Conscious Impact with host Mandu Thapa, a representative of the Sindhupalchok, Coffee Cooperative in Nepal. She will spend two days at camp training local community members in organic coffee farming. Once the training is complete, community members can officially join the cooperative and begin planting their trees. This spring, Conscious Impact will be launching our “More Than a Tree” campaign. Funds will support the farmers of Takure in their coffee cooperative and continue our agriculture program. Our women's empowerment program administered a 70 question survey to a group of young women at Nawalpur secondary school. The survey is constructed to asses what it means to be a young girl in this village and how we can address needs in the future. We have started a pen pal program between the Takure Primary School and a primary school in Kent, England. The goal is to engage students from Takure with others around the world. We have begun video messaging between the children. At Camp we are building permanent composting toilets. Our team has built two new toilet chambers from our CSEBs and bamboo. The final structure will incorporate a wall made from bottle bricks. We are upcycling trash from past volunteers into our very own toilets! This month we hired our first full time female employee, Chul Kumari. We are so excited to have her joining our all Nepali team at the training center. In addition, we are continuing to employ five women part-time every month for soil sieving. The 2015 earthquake in Nepal left hundreds of thousands of families without homes, and powerfully transformed the lives of millions of people across the country – none more effected than the children who overnight lost their families and their communities. On April 25th, 2015 hundreds of children suddenly became “orphans,” a concept previously unfamiliar. Many new orphans were taken in by aunts, uncles, older siblings or the community at whole, but others were taken to the nearby towns and cities looking for homes. In the months following the earthquake, eighteen of these children were brought to Mother Sister Nepal (MSN), a non-profit located in Nawalpur, the largest town near Takure. Mother Sister Nepal has worked in the region for more than 5 years providing services to local women and children and has gained the confidence of the community. Now, following the earthquake, MSN was given a new mission: caring for these 18 children. For the last 2 years, the children have lived in a temporary space on rented land about 1 hour walk from the Conscious Impact camp in Barigaon VDC. There they receive food, comfortable beds, clothes and most importantly a new family. The children range from 3 years old to 15 years old, and most attend school during the day. In the mornings and evenings, they are cared for by 4 young women from the local town, as well as Mina Thapa and her husband Umesh Adhikari, the founders and directors of Mother Sister Nepal. Now, it is time for a new home. The land agreement is over and Mother Sister Nepal needs a new place to house these 18 children permanently. Fortunately, the government has provided a beautiful piece of property near the school, and the community has already donated more than $10,000 towards the construction of a permanent building. With the additional support of the VITA Association in Switzerland, Mother Sister Nepal is ready to build! So, what is Conscious Impact’s role? Since the beginning, CI has been deeply involved in the design, engineering and resource management for the project. Our wonderful architect Frederick Dolmans of GroundUP with the support of architects Satwika Taduri and Oliver Atwood designed a beautiful building to meet all of the needs of the children’s home. With 8 rooms, a library, 3 toilets and a kitchen/dining hall, the orphanage will be ready to house as many as 30 children by May 2017. The project construction is being managed by Conscious Impact engineer Mariana Jimenez and a team of masons from western Nepal. The construction will use more than 10,000 of our Compressed Stabilized Earth Blocks (CSEBs), made locally with sustainable materials. Our hope is that this new orphanage will be a home to children in need for years to come, and will also represent one of the most beautiful and earthquake-safe structures in the region. If you would like to learn more about this project, get involved, or make a donation, please visit our website at www.consciousimpact.org or email us directly. Thank you to everyone that has helped make this project possible! Incredible, incredible day at the Women's Savings Cooperative work site today - we have just finished the last blocks for the rammed earth walls! This rammed earth building has been designed specifically for the local women's savings cooperative office and meeting place in the nearby town of Nawalpur. Our volunteers create a mix of 5 parts earth, 3 parts gravel, 1 part stone, and a little cement. Volunteers toss CSEBs to each other. Nitzan and Maya of Back to Earth Community have been here and sharing their immense expertise and knowledge with dozens of Conscious Impact volunteers and our Nepali staff, local masons, and also 3 members from the KTK-BELT studio team in eastern Nepal. 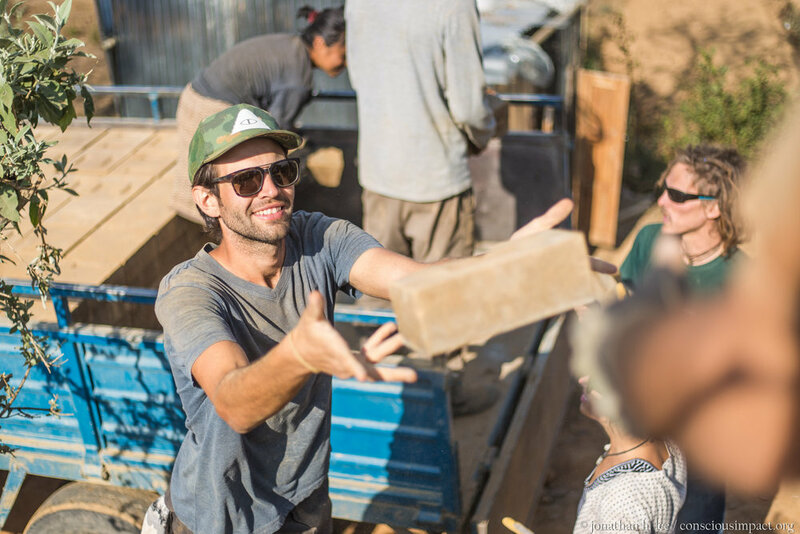 KTK-Belt had sent a small team here a few months ago to learn the process of making and curing Compressed Stabilized Earth Blocks (CSEB) with us, and last week they sent another group to learn the art of rammed earth. We are grateful for the massive energy and collaboration the large group is bringing each and everyday! Maya, Nitzan, and Allen pose next to the completed rammed earth walls. The local masons will proceed in laying the compressed stabilized earth blocks (CSEB) for the interior wall, and pouring the lintel beam, a structural horizontal block on top of the rammed earth walls. Such a beautiful day out today working together in the February sunshine. Deep thanks to all supporters from near and far, volunteers, and community members who have contributed to this momentous milestone. Onwards! CSEBs are passed inside the structure to build the interior wall. Since November 2016, Conscious Impact has been working to build a permanent office space for the Nawalpur Women's Microfinance Cooperative. For over 5 years, the 730+ women members have been assisting each-other in economic empowerment and self-sufficiency for over 5 years... all out of an office the size of a small closet. After purchasing land and hearing of our rebuilding efforts in Takure, members of the Cooperative reached out to us for assistance in building a larger, sustainable, affordable and earthquake-resistant space with which to continue their operations. The sixth annual Women's Microfinance Cooperative gathering. In response, Conscious Impact's resident architects (Satwika, Fred and Oliver) have teamed up with Nitzan and Maya of Back to Earth Community to design a functional space using an earth-building technique known as “Rammed Earth.” Volunteers, Nepali women and Nepali brick-masons alike have spent the last month working together to move rocks and dig the foundation for the project. It's been a truly inspiring experience, and by April 2017 we aim to provide Nawalpur with its very own completed rammed earth Women's Microfinance Co-Op Office building. Rammed earth is an ancient earth-building technique that requires a specific mixture of compacted sand, gravel, and soil to make full rock-wall panels. This technique essentially mimics how nature makes rock by compacting sediment in place. The whole process personally reminds me of making a bread recipe from scratch with local ingredients for a large group of people. You first use small molds to test differently proportioned “recipes” made with your locally available earth ingredients to see which one holds its shape best. The nature of our soil here is preferred for rammed earth because it is more sandy and gravely than clayey. Rammed earth is highly dependent on gravel for stability and durability. By the end of preparation for this project, Nitzan said he tested over 20 different mixtures to find the right one. Allen and Maxime ram the walls inside the formwork for a test section. Once perfected, you multiply your recipe proportions to a large enough scale that you can mix it in large batches on-site. These batches are then poured layer by layer into a wall formwork usually made with wooden panels. To construct the walls, people stand inside the formwork and use ramming tools (somewhere between a long-handled ice scraper and a garden-hoe) to compact the mixture layer by layer until it is finally full and stable. The result is a rammed earth rock wall. If you fit together enough of these wall sections on top of a stone foundation and put your desired roof on top (in our case, concrete) you eventually have a durable, affordable, earthquake-resistant, sustainable rammed-earth building. It is for these reasons that this method perfectly complemented our vision for the Co-Op, and why we chose to use it. After weeks of meeting with the women in the Co-op and finally getting the proper permits from the Nepali government, on Nov 19th we were able to hike to Nawalpur and begin construction. A team of six of us hiked the 30 minutes to town to start manually leveling out a terrace for the supply-truck we ordered carrying bamboo, stones, gabion (rock retaining wall) cages and sheet metal. After 40 minutes of shoveling, we managed to finish constructing the resultant soil-ramp with 5 minutes to spare. CI volunteer John moving rocks between terraces for the foundation. The rest of the day was spent constructing the foundation of a temporary bamboo/sheet-metal supply shed that will remain there to house our tools until the project's completion. We unloaded the trucks, measured out our bamboo poles, cleared out a 3x2 square meter rectangle of vegetation, and dug four 60-cm deep holes for the frame. After being in the sun all day and eating heavy chowmein for lunch, I ended up falling asleep on the ground for 20 minutes before returning to work. Nevertheless, we finished the foundation prep work for the shed to go up the next day. CI Volunteer Joshua helps Maya and Nitzan (behind) move rocks for the gabions. BEFORE - Setting the stage to build gabions for the retaining wall. AFTER- The retaining wall is completed! Nitzan, putting the finishing touches on the retaining wall. It is now Day #22. In 3 weeks, we have built a septic tank in addition to a beautiful retaining wall supporting the Co-Op structure. In two days, we will also be ready to pour the cement for the foundation before building the walls in January. I have been back at the project on multiple mornings to clear out, level, dig and transport rocks for the Co-op foundation, and the experience has been nothing short of inspiring. It has been exciting and empowering to work alongside so many people from different parts of the world to bring this project into fruition. Day 2: Clearing the land. Day 16: Foundation in progress! More than 40 volunteers, Nepali women and masons came out for our Saturday Tea Party to kick off the digging for the foundation. On any given day, anywhere from 10-15 people from all different backgrounds are working on site doing manual labor side by side to complete this project. It has been a true example of sustainable collaboration with a meaningful cause, and I cannot express enough how important it is that a project like this exists. Ultimately, we hope it will serve as a living example of the potential for sustainable earth-building technology in an area that sorely needs it. Saturday digging party to get ready for constructing the foundation. Hammers with handles made for us by the local carpenter next door. Stay tuned for more updates! "Like" us at Back to Earth Facebook Page and Conscious Impact Facebook Page. Want some more visuals of the project? Here's a short video of the last 3 weeks of work! Bricks, bricks, bricks…beautiful, strong, inspiring bricks. Each day in Takure, we rise from our tents, share breakfast, and head once again to the training center where we make as many Compressed Stabilized Earth Blocks (CSEBs) as possible. These bricks already built a school, and now in the coming months they will be used to build a community center, an orphanage for 18 children and local homes. This holiday season, we are renewing our commitment to these bricks and the impact that they have. The bricks provide jobs to youth without other options. They provide earthquake-safe building resource to families seeking a way to rebuild stronger and safer homes. And they provide a symbol – of hope, of strength, of unity, and of possibility. Our long-term goal for the Training Center is to become a financially sustainable business run primarily by local Nepali staff, selling bricks to community members around the region. This will enable these bricks to be available for years to come and will allow for long-term employment of local youth. Each donation allows us to continue our brick production through the next months as we grow the company to serve families in need. Looking for other ways to contribute? Consider volunteering, or contact us about hosting your own fundraiser! Our First Official CSEB Training for Nepalis! Brick training! Conscious Impact is very excited to welcome 4 community members from Eastern Nepal that represent the KTK-BELT Project (belt-project.org/). These guests are attending Conscious Impact's first ever Compressed Stabilized Earth Brick training week with Nepali professionals from outside of Takure, Sindhupalchowk. Our team has been making bricks since November 27 2015, with Auroville's Auram 3000 brick making machine. Members of the KTK-BELT Project have the same machine, making knowledge transfer and experiential education practical. Today we began a 4 day training covering all of the information we have learned ourselves from the past year. The four program participants are making CSEBs alongside our 12 person staff from Takure village. This is a special step in Conscious Impact's project evolution as it represents a scalable approach to brick making in post-earthquake Nepal. 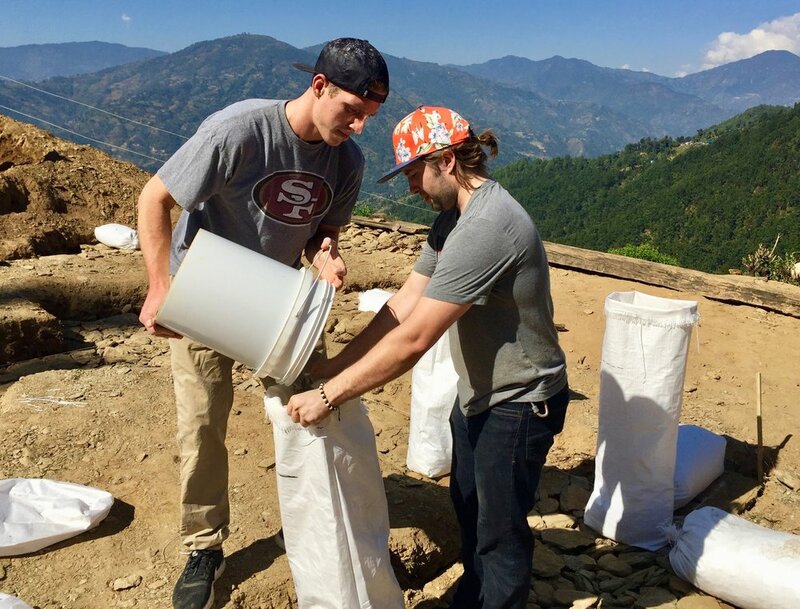 Our team can leverage our experience from this past year, making about 30,000 bricks in rural Nepal. If more organizations and networks of professionals are able to produce their own construction materials from the soil beneath their feet, Nepal can rebuild in a timely, cost effective manor with minimal environmental damage. More people in temporary shelters will be empowered to make decisions about their long term, permanent home. Conscious Impact supports earth oriented construction methods that respect local communities and their precious resources. CSEB production and construction are means of having rural communities construct their own home with local materials. As Nepal moves forward with rebuilding from the April 25, 2015 earthquake, Conscious Impact is here to serve and teach in whatever capacity that supports localized solutions to villagers around the country. Thank you for your support and celebrating this landmark moment in Conscious Impact Nepal's young NGO life. We look forward to sharing all we know and learning to rebuild Nepal together. Namaste. In Nawalpur, the closest trading town to Takure where I live, is a small room where Chitra Kumari sits at her desk. Her job is to manage the accounts for more than 740 women around the region that receive savings and loans services through her cooperative. This organization has developed over the last five years, and now almost every household in the area is involved. This year, Conscious Impact is excited to support the construction of a new office and skills development center for the Cooperative. To be built out of rammed earth, this new space will represent an organizing hub for women from across the region. In addition to providing a safe space for women’s development, this project will also demonstrate the beauty, strength and affordability of rammed earth construction, a more environmentally sustainable construction technology than standard brick or cement building. Our friends Nitzan and Maya of Back to Earth will provide the expertise, and oversee the construction this fall. Come join us in Nepal for the build this fall, and learn more at http://www.consciousimpact.org/women. The Money is Here...What's Next for Nepal? In the last month, hundreds of families around the Nawalpur VDC in Sindhupalchok received 50,000 Nepali Rupees (about USD $500) each. After more than a year and a half waiting for government aid, there is a sense of relief and excitement at the money finally arriving. But what does it really mean? In Takure, where I live, families are now left to decide how to spend these funds. The government, in partnership with Red Cross, says that these funds need to be used to build the foundation of a house. Then, once the foundation is reviewed and given approval by a government engineer, as much as USD $2500 more could be provided to the family. The expectation is that by the end of October, hundreds of families will be building the foundations to their homes. Nodanath Mishra, one of the kindest men I know, stands next to his newly built home. Similar to those built before the earthquake, this home is made of stone and mud. But will this USD $500 be enough to start? And most importantly, how will the homes be different than before? Can the government really oversee the earthquake-safe construction of hundreds of thousands of homes in Nepal? As a member of a local brick-making organization producing sustainable, earthquake-safe building materials, I am interested to see how this will unfold and how, if at all, we at Conscious Impact, can be of service in Nepal. Please share earthquake relief experiences from around Nepal and the world, and I will continue to share stories from here in Takure. As we respond to the earthquake in Nepal, Conscious Impact must decide how to structure our work. Are we a non-profit or a for-profit? And what does that even mean? To many, being a non-profit (also sometimes referred to as a charity or NGO), means that you are a do-gooder, motivated by social service. For-profits, on the other hand, are all about the money. While that can be true, to me the main difference is really just the tax forms: a 990-EZ and a 1023 rather than a form 8832 or 1120. Or something like that. As we respond to the earthquake in Nepal, we are establishing both a non-profit and a for-profit, both called Conscious Impact Nepal. The for-profit will produce and sell Compressed Stabilized Earth Blocks (CSEBs), locally-made and environmentally-sustainable building materials to rebuild homes. This private company will be owned and run by local Nepali men and women, and will be allowed to make profit (though it probably won’t for the first few years). The non-profit will manage any charity projects in Nepal, including school construction, that require non-profit status. It will be made up of 7 unpaid board members (a requirement in Nepal) and will be eligible to receive local and national grants. With both entities, we are ready to work: whether making bricks, providing agricultural trainings, hosting international volunteers or building homes, we have the legal and financial structure we need. For more information like this and other international service stories and tips, keep following: http://www.orionhaas.com. Namaste from Nepal! Camp Opens for Season 2! After a couple month hiatus while the monsoon rained poured, we are so happy to be back in Takure. We returned to a lush and overgrown camp, the welcoming smiles of familiar faces, and more dal bhat meals than we ever thought we could consume. Our first volunteer group for the season has arrived. Ten generous and inspiring human beings, who have flown across the world to selflessly join us in our work. We've been spending our days getting camp back in order, rebuilding steps, replacing bamboo, and making bricks. Grateful to all of our volunteers for their constant and ever-giving support and love. The beautiful adventure of season two has begun! Volunteers helped reopen camp with some restoration projects! Here they are passing large rocks to repair a few of our stairs in camp. Mariana Jimenez shows volunteers how we test each batch of CSEBs during their training at the Takure Training and Production Center. First day on the job! Mixing mixing mixing a batch of CSEBs. Cofounders, Allen and Orion, standing proudly with their "best dancing" award they received from a community celebration. Took this beautiful group on a day hike to Gupha to rejuvenate ourselves in the beautiful Himalayas. I am not a fan of big machines. Bulldozers, cranes, 18-wheelers, aircraft carriers, whatever. They scare me. Maybe it’s that they have so much power, or that they at times lack finesse. Overall, I would rarely invite a big machine onto my property. But this last week, that is exactly what we did. Conscious Impact is excited to launch a new educational video series explaining how to make Compressed Stabilized Earth Blocks! Check out our Vimeo page for more videos and to get a glimpse of what our team in Nepal does everyday to support sustainable, long-term rebuilding in Takure. Come volunteer with us to learn about natural building and support the rebuilding process in Nepal. Conscious Impact and YUWA Unity Nepal just launched our month-long fundraiser, Bricks for Nepal, to help us raise funds to buy the necessary clay, sand, and cement for brick production. This holiday season our community will be producing as many bricks as possible and we need your help! For every $1, we can produce 2 bricks. About a week ago our crew of long term volunteers piled up blankets and pillows in the common space of our camp and slept head to head, awaiting the arrival of our brick press. Anytime anything arrives at our camp in Takure, we are excited. New volunteers, fresh veggies dropped off by local community members, and chocolate are all greeted with an abundance of enthusiasm. But this brick press! 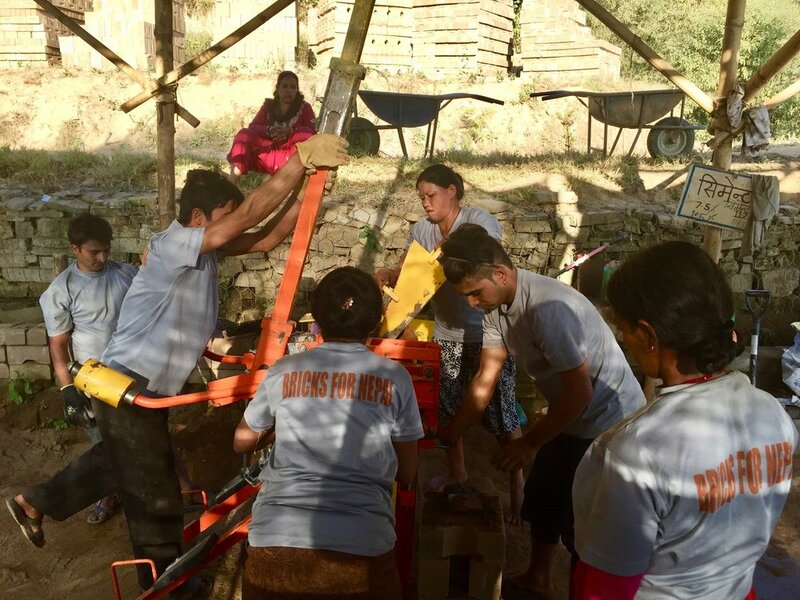 This Auram 3000 Brick Press had been lollygagging at the Indian border for over two months while our dedicated team of volunteers and local community members created a beautiful home for it in the mountains and terraces of Takure. They were not going to let it sneak up in the dark of night. They welcomed the press at the training center at 3am and took photographs in dawn's first light for those of us with the misfortune to not be at camp for its impromptu arrival. Truth be told, the late arrival wasn't the brick press’ fault. Unrest at the border with India kept our beautiful, bright orange, brick press caged up. But now, assembled, and fully functioning, our brick press is ready. We are ready. The community of Takure is 100% ready. We are making bricks. CSEB's to be exact. Compressed Stabilized Earth Blocks. Sourcing all of our raw materials from the surround 8 km, our CSEB's will be local, sustainable, and manually produced at our Brick Production and Training Center. Our team is aching to get started. In the next 6 months, before the rains of the monsoon are upon us, we want to make 60,000 bricks. We want to complete the rebuild of one primary school and start the second. We want to show the village of Takure our dedication through our actions here on the ground but also through the continued generosity of our friends and family around the world. So we ask for your help. Come join us, mix sand, gravel, clay, and cement and make bricks. Spread the word. Those of you that were here, share your stories with the people around you. Those of you that are coming, tell everyone you know that you are about to touch a village and a community in a beautiful and enduring way. You will help them make bricks, build new schools, and rebuild their lives.